I didn’t plan on canning tomato soup but when my sister-in-love sent me this recipe I couldn’t resist picking up 25 pounds of tomatoes at the farmer’s market on Saturday and trying it. Sure glad I did because it’s delicious! It’s the freshest-tasting tomato soup I’ve ever had and couldn’t be easier to make. Yield: 25 pounds of tomatoes gave me 21 pints of soup. Note that the recipe is for 4 pounds of tomatoes. I tripled the recipe and made two batches. Combine ingredients and simmer for 10-15 minutes. Blend in food processor or blender until smooth. I used the food processor for the first batch and it worked fine. On the second batch I used my immersion blender and that was quicker, easier, and blended better. Ladle soup into hot jars, leaving 1 inch head space. 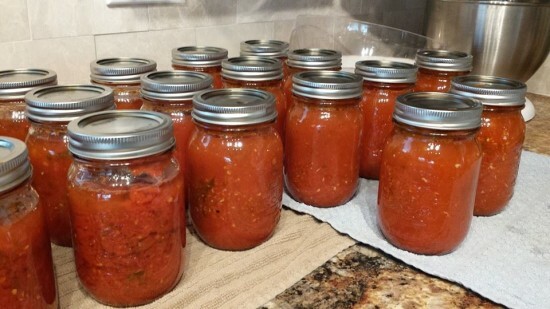 My mother canned tomatoes every year but she never used basil or garlic. You are really making the most of the summer’s bounty. This is a new way of preserving tomatoes for me this year, Marian. One of the jars didn’t seal and so we ate it for lunch the next day–it was so good! I suspect you have many special recipes from your mom’s kitchen too. Treasures, aren’t they? !